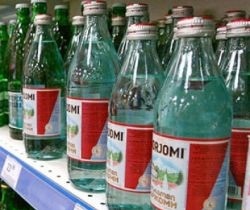 The Georgian mineral water Borjomi will soon be on sale in Russian supermarkets. TBILISI, DFWatch–After a second round of inspection, the Georgian mineral water Borjomi has been allowed to export to Russia. The watershed decision became known in Russian media on Thursday. Russian customer rights’ service known as Rospotrebnadzor has completed a second inspection of Borjomi, which in the near future will be able to receive confirmation to register with authorities for export. Borjomi was among other Georgian companies which have been inspected first by a group of experts from Russia in February, but Rospotrebnadzor then unexpectedly stated that it could still not be allowed to export to Russia due to ‘certain questions’. After government changed in the country Bidzina Ivanishvili’s government started talks with Russia to get Georgian product back to the Russian market. This process is in progress now. Minister of Agriculture Davit Kirvalidze said a few days ago that more than 60 Georgian wine and mineral water companies will be able to export to Russia. He said that there are about 80 wine companies and four mineral water companies that want to export there, but according to preliminary data, only 60 of them will be allowed to export. Kirvalidze also said that drinks won’t be the only product to be exported; also Georgian vegetables will be allowed onto the Russian market ‘very soon’, while fruit and other agricultural product will start export from fall.